An exhilarating Florida lifestyle is awaiting you at Esplanade on Palmer Ranch. This spectacular community brings a rich array of resort-style amenities and the renowned Esplanade experience to distinguished Palmer Ranch. Located in one of the most sought-after areas on Florida’s West Coast, this master-planned community offers the best of all worlds with close-to-nature ambience. Access to amazing local attractions and a wealth of luxurious on-site amenities that make daily living seem like an extended vacation. Each day brings a new opportunity to explore, engage and experience life to its fullest. Or just relax and soak in the beauty that surrounds you. Enjoy it in a beautiful new single-family or condo home in Esplanade on Palmer Ranch – where every day is a vacation, and you don’t need to pack! Join the VIP Interest now to assure you stay informed about new opportunities and exciting details at Esplanade on Palmer Ranch, a Sarasota resort lifestyle community. Model homes are open daily. Visit today for a tour! One of the most appealing features of Esplanade on Palmer Ranch is its ideal location. With a distinction of bordering the beautiful Oscar Scherer State Park, a variety of recreational opportunities are accessible. A walking trail along a natural creek connects to Sarasota’s Legacy Trail, a 10+ mile system of paved trails that is perfect for walking, jogging and biking. The natural beauty of the neighborhood will be enhanced by lush landscaping, grand oak trees, several lakes, and two large wetland preserves. Esplanade on Palmer Ranch is enviably located near highly rated schools as well as shopping, entertainment, and transportation centers. Famed Siesta Key Beach is just five miles away, and the community is just a short drive north to St. Armand’s Circle with its array of retail and restaurants. To the north approximately 10 miles is the fabulous University Town Center offering a wide array of shopping, restaurants, and services. The neighborhood strikes the perfect balance between being away from the hustle and bustle while providing convenient access to shops, the interstate, medical facilities and Sarasota International Airport. Looking for your dream home in a stunning Sarasota, Florida location? Sign up to receive email updates about Esplanade on Palmer Ranch. Contact one of our Internet Home Consultants for more information. Esplanade at Palmer Ranch is an all-ages community. All information (including, but not limited to prices, views, availability, school assignments and ratings, incentives, floor plans, site plans, features, standards and options, assessments and fees, planned amenities, programs, conceptual artists' renderings, tax rates and community development plans) is not guaranteed and remains subject to change, or delay without notice. Prices may not include lot premiums, upgrades and options. Floor plans and elevations are an artist's conception and are not intended to show specific detailing. Floor plans are the property of Taylor Morrison, Inc. and its affiliates and are protected by U.S. copyright laws. Photos are for illustration only and do not necessarily represent actual community. Community improvements, recreational features and amenities described are based upon current development plans which are subject to change and under no obligation to be completed. Community Association and other fees may apply for certain activities and events. This is not an offering in any state where prohibited or otherwise restricted by law. Please see a Taylor Morrison Community Sales Manager for details and visit www.taylormorrison.com for additional disclaimers. ©December, 2018, Taylor Morrison of Florida, Inc. CBC1257822. The Esplanade® name and logo are federally registered. All rights reserved. Gated Esplanade on Palmer Ranch promises to be a year-round vacation for residents. As with all Taylor Morrison’s Esplanade communities, the centerpiece of Esplanade on Palmer Ranch includes a planned, elegant amenity center with wellness services, a catering kitchen, lounge areas, fitness center and activity rooms. A full-time on-site Lifestyle Manager will be on hand to interact with residents and coordinate special activities, parties and events. All amenities will be available for the exclusive use of community residents and their guests. Think of it as your own private resort practically in your own backyard! Choice is wonderful and Esplanade at Palmer Ranch is pleased to offer you even more choices than before. If you a prefer single-family home, you can choose from 11 contemporary open-concept single-story floor plans. If you want the low-maintenance convenience of condominium living then the new single-story garden condo homes are just your style. Either way, you’ll have a beautifully appointed home with features that add comfort, ease and value. 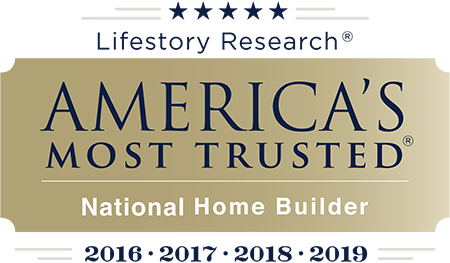 You’ll also have peace of mind knowing your home is built to the uncompromising standards of quality and craftsmanship that have made Taylor Morrison one of the most respected Sarasota homebuilders and America’s Most Trusted® Home Builder in 2016, 2017, 2018 and 2019*. Your day begins full of possibilities, what you do with your day is up to you. Esplanade on Palmer Ranch is where you can explore, engage, recharge or just relax. You’ll find an exciting range of recreational and social opportunities and an on-site Lifestyle Director to help you discover them. Every day is an adventure and Esplanade has it all. Flexible options such as dens, media and game rooms, additional guest suites and outdoor living spaces will make your dream home a reality. As part of the Esplanade on Palmer Ranch community, Legacy Estates residents indulge in all the same top-notch amenities and activities that are uniquely Esplanade.